WWE Elimination Chamber once again was packed with good matches and some spots which left the crowds in awe. From title changes to surprise showdowns, the show gave fans a good taste of what to except at WrestleMania 35. The event saw a few championships change hands, and some being retained in grand fashion. 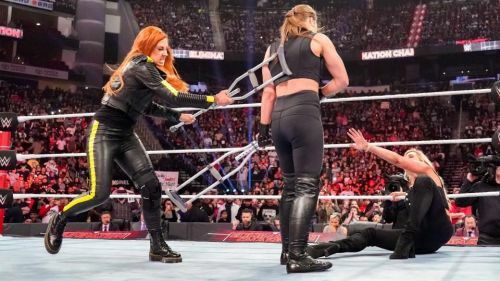 One particular spot that the fans loved included The Man Becky Lynch giving Ronda Rousey and Charlotte Flair a beatdown, which might lead to a triple-threat match at WrestleMania. Even though there were a few great spots, there were surely some questionable ones and some bookings that didn’t make much sense, we are glad a few things didn’t happen at the event which could have resulted in some bad bookings. Here's a look at three things we are glad did not happen at the pay-per-view. Balor has been an outstanding performer in WWE for quite some time now, and the lack of a championship belt around his waist was surely denting his reputation a bit. The former Universal Champion squared off against Intercontinental Champion Bobby Lashley and his mouthpiece Lio Rush for the championship. Thankfully, Balor pinned Lio Rush to win the Intercontinental Championship rather than Bobby Lashley. While Lashley too deserves a title around his waist, Balor pinning Rush means the Lashley and Balor feud can now go further into WrestleMania for the belt without Lio Rush interfering any further. It also does not ruin Rush’s reputation as he is mainly a 205 Live performer, and can go back to the brand and fit in comfortably there. As for Lashley, his character probably took the best turn last night after he attacked his mouthpiece after losing the title.